No, the bearing itself. I have no fan attached, using an electrical. One of the four threaded bolt holes sheared off at some point. When I pulled the cover off for inspection of timing last week, the bolt was basically just hanging on. I decided to leave that bolt out because I could imagine it flying off at some point... well, the pulley is now out of balance and the bearing is being eaten alive. I could "glue" the bolt back in to rebalance it, it does diminish the sound, but you can still tell that the pulley is making noise. That's the water pump if you are talking about where the clutch fan would go. The bearing isn't replaceable , you need to replace the water pump itself . Pretty sure the fan does not attach to the water pump. It's the big pulley that is free spinning right in front of the radiator. I don't have a fan clutch or fan attached to it. The noise goes away completely when I pull the belt. The pulley makes a very slight noise when I spin it by hand. When I put the belt back on, and also fixed a fourth bolt in place to balance it out, the "rocks" noise went away, but I could still hear that the bearing is now damaged. So as far as I can tell I need a new front cover because that bearing does not seem to be replaceable. On a 300 this is called the front cover idler bearing. Very common failure/replacement item. There are dozens of write ups all over the web on how to pull out the current, and press in a replacement. The bearing is not meant to be replaced (Rover planned to sell us all new front timing covers). But back on track: What about Allmakes vs. Bearmach? My go to with engine parts is to buy from Turners. The reason being is that they have sold many thousands of engines and know what comes back as warranty claims. They are only selling genuine for this item...read into that what you wish. Sorry I misunderstood, the ideler bearing is replaceable. I think it's a 6203? I had a couple of the flanges made. Most any machine shop can make one quickly out of mild steel which is/are better than the original. I may be misunderstanding, but I think he is saying part of the cover itself is broken. Perhaps some details or a photo would help with advice. Yeah, I get what you are saying. I'm just looking for a general overall experience with one brand or another, and I thought that was sort of what this thread was about. When it comes to getting the threaded flange for the bolts, I'll have to try to think outside the box like that next time. If I knew a machine shop nearby, and could get that alternate bearing, that would be the way to go. As it is, ordering the part as-is is the simplest method to get the car back on the road. And since this is my daily, when it is down, I don't have a way of running around town to pick up the alternate parts, etc... then figure out how to do the alternate job of putting it together, etc.... etc.... I guess that's what we have guys like Uncle Doug for! Okay, The "G" suffix as used by most of the parts wholesalers indicated an OEM part. They normally use "LR" as a suffix for genuine parts sold by Land Rover. From what I can see, neither AB or RN are very clear on the source of their parts. The best place to shop for a clear choice in parts manufacturer is LR Direct. You can often choose between LR, Britpart, Allmakes and Bearmach and sometimes others. The price ranges are interesting and it’s nice to have a choice. Yet, Genuine aside, the topic of Britpart vs Allmakes vs Bearmach is a bit like getting on a discussion about motor oil. I have an increasing sense ( perhaps faulty) that as our trucks age and demand for parts shrinks, that we will be increasingly reliant on non genuine parts to keep our trucks going. Areas of special concern are things like the fuel pump for our D90 V8s. There weren't very many V8 powered D90s ever made. We were the first with rear mounted D90 fuel tanks..... Tdis were side saddle until later. As a longtime old Triumph car owner, we Triumph owners have seen this experience for sometime. One example is the water pump for the TR7 / Stag. Saab 99’s use the same pump. OEM has been unavailable for decades. Around 15 to 20 years ago the British parts suppliers were able get a place in India manufacture them. It is important to note the water pump is really just the impeller, drive shaft with gear, bearing, and a bearing / seal housing that fits into the top of the short block and is driven by a jack shaft. It is an obnoxious repair job. Id rather replace a clutch twice than replace a water pump. When they fail it is entirely possible for coolant to go right into the crankcase. Long story made short, the India made pumps fit and worked great for a while. However, the driven gear on the pump of the India made pumps is not the correct hardness and it and the jack shaft destroy one another in short order. Then you need to pull the engine, potentially for a lower end rebuild and most certainly a replacement jack shaft which is anything but easy to get. 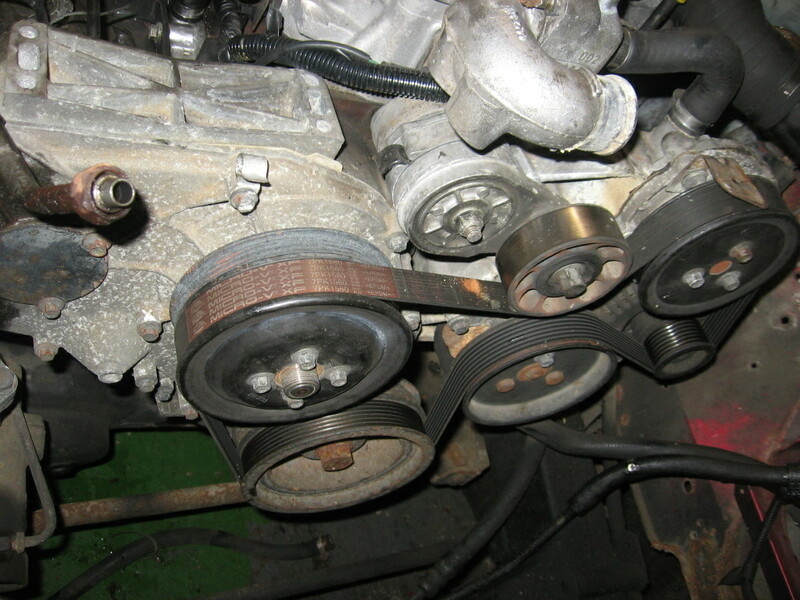 I hoarded Saab OEM water pump rebuild kits when they were still available. Hopefully the seals don’t rot before I need them. I will say, while the pump is annoying to replace, the originals in mine made it 30 years before they began to leak. There are a lot of junk new TR parts out there. Orphan car brands get what they get, however. When I branched into LR I was hopeful the long production run of LR “Defender” would help guarantee a longer availability of good parts. If it is a critical component or one that could damage other parts as a result of failure, I try to find genuine parts. Sadly, it looks like genuine isn’t enough. Great idea for a post topic. When you use the John Deere bearing do you have to remove the unused shaft end?